A night to remember for all striving female entrepreneurs! On November 27th, WE Talks and ZURI held its first WE Pitch, a fun, exciting evening for ambitious female entrepreneurs to showcase their startups in front of a supportive audience and a judging panel of preeminent investors (Fran Hauser, Anu Duggal, Pat Hedley, Heather Hartnett, Christina Vuleta, and Tikhon Bernstam). Congratulations to its top three finalists which includes, Tzvia Bader @ TrialJectory, Mandi Nyambi @ Le CultureClub, and Jess Riegel @ Motivote. All finalists have connected with world class investors, received media exposure and customized feedback. WE Talks was founded by Lana Pozhidaeva with a mission of providing ambitious corporate and entrepreneurial women with a safe, supportive environment. 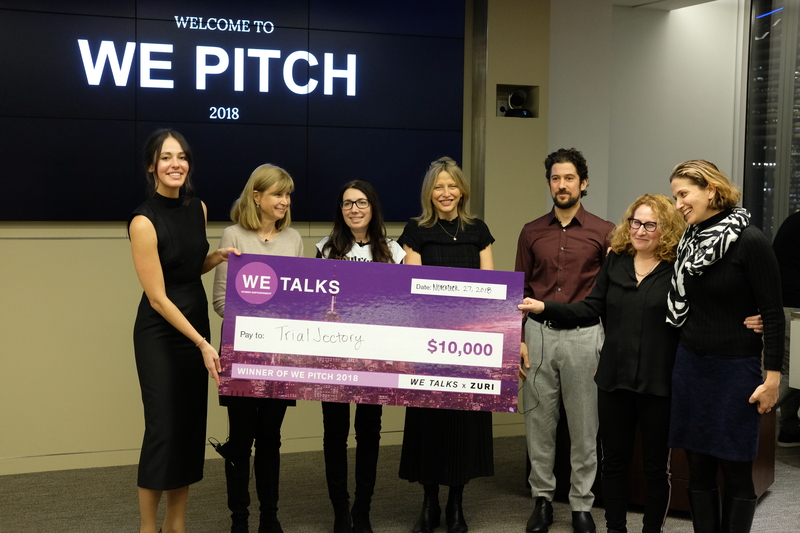 The idea of the pitch contest came from the discovery that female founders not only don’t get enough venture capital (which has been consistently 2.2% over the last few years ), but also lack social capital and media exposure. WE Talks was excited to announce that they got 300 + applications from early stage female startups in just two weeks (without investing in any PR). Word of mouth has been their strategy from the very start. The applicants came from a wide range of “female industries,” but also included some wonderful innovative tech enabled companies. Some of the tech applicants included: Trialjectory, Le Culture Club, Dripkit, Seedsprint, Mighty Well, Komae, MicroEra Power, Five To Nine). Be sure to stay on the lookout for more of WE Talks fabulous events for 2019! Rumor has it that there will be a female founded breakfast series launched early next year! WeTalks (featured @ Forbes) is series of Women Empowerment events – panel discussions around topics like Fundraising, Branding, PR, and Digital Marketing. Each month they grew event attendance by 50% and have even partnered with awesome brands like Minibar, Peter Roth Skincare, Zeel, and TOPSHOP Personal Shopping.